In order to become a general contractor in Oregon, you’ll need to seek out proper licensing and education as provided by the Oregon Construction Contractors Board (CCB). In addition, Oregon law requires anybody working for compensation in any construction activity to register to do business with the state, provide proof of workers’ compensation and general liability insurance, and to comply with state tax regulations. In certain instances, additional fees and paperwork may be required. For example, contractors applying for a license are required to obtain CCB surety bonds, the value of which will depend on their type of contractor endorsement. CCB Licenses are good for two (2) years. Oregon’s general contractor licensing requirements are varied, and it is imperative to make sure you know and have met all of them before applying. Below is a comprehensive outline of the CCB’s licensing requirements for Oregon general contractors. Qualified real estate property managers managing a building under a property management agreement. As you can see, Oregon’s CCB is pretty clear on which trades are regulated and need licensing to operate legally. Separate from residential or commercial contracting licenses, other restricted residential endorsements are required for locksmith services, home inspector services, and others. What Do You Need To Become a General Contractor in Oregon? Residential general contractor (RGC): These contractors may supervise, arrange for, or perform (partly or completely) an unlimited number of unrelated building trades involving any residential or small commercial structure or project. Residential specialty contractor (RSC): These contractors perform work involving one or two unrelated building trades for residential or small commercial projects. Residential developer (RD): This classification is for residential developers who arrange for the construction of structures, or development of property, that they intend to sell. Home services contractor (HSC): Contractors with an HSC endorsement may operate a business offering service, repair or replacement under a home services (warranty) agreement. Residential locksmith services contractor (RLSC): Contractors with an RLSC endorsement may operate a business offering locksmith services. Home inspector services contractor (HISC): Contractors with an HISC endorsement may operate a business offering home inspection services. Home energy performance score contractor (HEPSC): Contractors with an HEPSC endorsement may operate a business issuing home energy performance scores. Residential restoration contractor (RRC): Contractors with an RRC endorsement may operate a business offering restoration services for residential and small commercial structures. Commercial General Contractor Level 1 & 2 (CGC1, CGC2): These contractors may supervise, arrange for, or perform (partly or completely) an unlimited number of unrelated building trades involving any small or large commercial structure or project. A Level 1 contractor must have 8 years of construction experience, while a Level 2 contractor must have 4. Commercial Specialty Contractor Level 1 & 2 (CSC1, CSC2): These contractors perform work involving one or two unrelated building trades for small or large commercial projects. A Level 1 contractor must have 8 years of construction experience, while a Level 2 contractor must have 4. Commercial Developer: This classification is for commercial developers who arrange for the construction of structures, or the development of property, that they intend to sell. These are just summary descriptions of each type of endorsement. The HSC, RLSC, HISC, HEPSC, and RRC are restricted residential endorsements, separate from other residential endorsements. More information on endorsement types can be found on the Oregon CCB Endorsement Chart. Second: Complete your pre-license training and pass the test. If you’re at least 18 years old and have completed at least 16 hours of training on law and business practices from an approved education provider in Oregon, you’re able to take the Oregon exam. This 16 hour training can be supplemented by the NASCLA Accredited Examination for Commercial General Building Contractors. Third: Register your business with the Oregon Secretary of State. You’ll need to file as a corporation, LLC, or assumed business name with the Oregon Secretary of State, Corporation Division, or call 503-986-2200. Fourth: Obtain a CCB surety bond in the amount required by your endorsement type. The CCB provides detailed information on bonding requirements. bonds must be accompanied by the application, and will vary from $10,000 t0 $75,000. Fifth: Provide proof of general liability insurance. These Certificates of Insurance must accompany the application, and must name the Construction Contractors Board as the Certificate Holder. The amount of liability insurance that you will need depends on your endorsement type. Sixth: Provide proof of workers’ compensation insurance if you’ll be hiring employees. The Oregon Workers’ Compensation Division can provide more information on workers’ compensation insurance. You can visit Oregon Workers’ Compensation Division website or call 503-947-7810. Exemption information can be found on the CCB’s official workers’ compensation page. Seventh: Obtain other employer account and tax numbers. Businesses operating in Oregon are required register at the state level with the Oregon Department of Revenue (503-378-4988), as well as at the federal level with the Internal Revenue Service (1-800-356-4222). Eighth: Complete and submit an application. Select the residential only, commercial only, or both residential and commercial (dual) application as it applies to you. Fill out the full application and submit with your original bond, your insurance certificate, and a $250 application fee by Visa, Mastercard, Discover, or by check. It’s worth noting that there may be additional fees incurred at local and county levels. Check with local municipalities and county codes for further information. The CCB license exam can be administered to those who are at least 18 years old and have completed at least 16 hours of training on law and business practices from an approved education provider. A list of approved pre-license educators You can review this list of approved pre-license educators, along with whether they offer courses online, in Spanish or English, and how much the course will cost. This 16 hours of pre-license training is not necessary for applicants who have passed the NASCLA Accredited Examination for Commercial General Building Contractors. Proof of passage of the NASCLA Accredited exam can be emailed to the CCB at ccbeducation@state.or.us. Those who take the training and pass the test are referred to as Responsible Managing Individuals (RMI), and must be an owner or employee of the business, and must manage or supervise the business’s construction activities. An RMI must apply for their CCB license within 24 months of passing the test. These applications must be printed off and completed in either black or dark blue ink. The application itself will ask you to specify whether you’re a sole proprietor, corporation, LLC, trust, partnership, or joint venture. From there, you’ll skip to a specific set of pages in the application pursuant to your business type, where you’ll provide your state BIN and your federal EIN numbers, as well as information about workers’ compensation. You may be required to provide your driver’s’ license number or other form of identification. Additionally, the license application asks for information on arbitration and unpaid debts, as well as whether or not the applicant has a criminal background. The CCB has the authority to do criminal history checks on all applicants, so only provide accurate information. 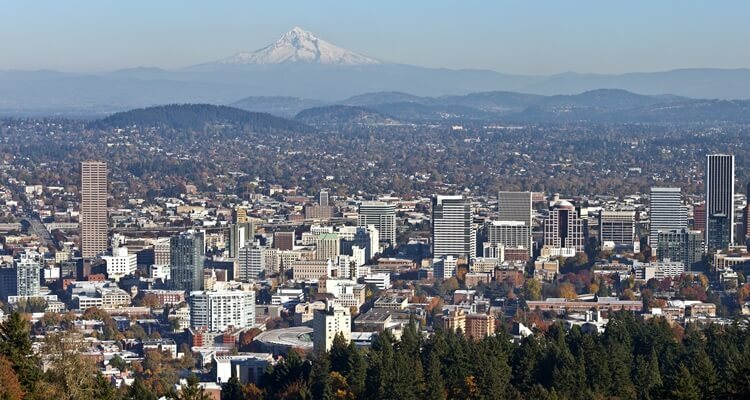 Oregon has a variety of planning, zoning, and construction permits that need to be obtained based on where the construction is going to take place. These requirements vary from location to location. Fortunately, Oregon allows the use of an ePermitting system, which allows licensed contractors to apply for building permits online with participating cities and counties. More information on statewide permit and inspection services is also available online. All contractors wishing to do business in the State of Oregon mus file their corporation, LLC, or assumed business name with the Oregon Secretary of State, Corporation Division. Call 503-986-2200 for more information, or visit the Oregon START A BUSINESS Guide. All new businesses in Oregon must register their business name with the Secretary of State’s office. You can print out your Oregon business registration forms, while those wishing to apply online can visit the Oregon Online Business Registration Page. Any in-state or out-of-state employer with employees who are working in Oregon are required to obtain a Business Identification Number (BIN). Visit the Oregon Department of Revenue’s website for more information on obtaining your BIN. Oregon law requires all employers to secure workers’ compensation insurance for your employees prior to hiring. More information is on the Workers’ Compensation Division website. The Oregon CCB State Licensed Contractor Search can help you look up qualified contractors in Oregon.